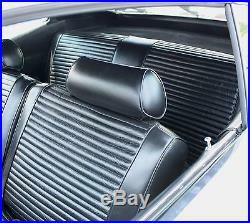 1970 Ford Torino Bucket or Bench Seat Cover Set -Authentic OEM Reproduction. 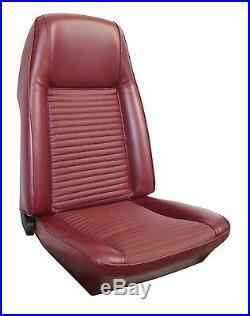 Our 1970 Torino Seat Upholstery is a correct reproduction of the original. For either Fastback or Convertible. We offer the original Corinthian grain with Ruffino grain inserts in 32 oz. Vinyl, with the correct horizontal patterns sewn as original. Choose Fastback or Convertible, bucket or bench and color. Message us with the exact model, seat type, and color combination you would like. So that we can guarantee you get the correct product fit for your car. Corinthian grain vinyl with Ruffino grain inserts. Correct 6 stitch per inch stitching. Correct colors matched to the original vinyl. Black (2 Tone) L-3722 (I=L-3400). Blue (2 Tone) L-3788 (I=L-4069). Dark Red (2 Tone) L-3724 (I=L-3440). GInger (2 Tone) L-4061 (I=L-4070). Ivy (2 Tone) L-3628 (I=L-4071). Vermillion (2 Tone) L-4063 (I=L-4073). Green (2 Tone) L-4234 (I=L-4238). White (2 Tone) L-4062 (I=L-4072). The item "1970 Ford Torino Bucket or Bench Seat Cover Set -Authentic OEM Reproduction" is in sale since Wednesday, November 29, 2017. 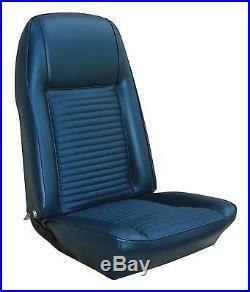 This item is in the category "eBay Motors\Parts & Accessories\Vintage Car & Truck Parts\Interior\Seat Covers". The seller is "specialtyautointeriors" and is located in Placentia, California. This item can be shipped to United States, Canada, United Kingdom, Denmark, Romania, Slovakia, Bulgaria, Czech republic, Finland, Hungary, Latvia, Lithuania, Malta, Estonia, Australia, Greece, Portugal, Cyprus, Slovenia, Japan, China, Sweden, South Korea, Indonesia, Taiwan, South africa, Thailand, Belgium, France, Hong Kong, Ireland, Netherlands, Poland, Spain, Italy, Germany, Austria, Israel, Mexico, New Zealand, Philippines, Singapore, Switzerland, Norway, Saudi arabia, Ukraine, United arab emirates, Qatar, Kuwait, Bahrain, Croatia, Malaysia, Brazil, Chile, Colombia, Costa rica, Panama, Trinidad and tobago, Guatemala, Honduras, Jamaica.